I used to work at the little place called Bagel Me!, if you've never heard of it, I suggest you familiarize yourself with it quickly. Yes, I had to wear a visor and apron, and yes I often had to deal with pesky customers, and yes I am forever embarrassed about it, but for some reason I always come back and I still continue to love it immensely. Albeit simple, their food was just amazingly tasty. 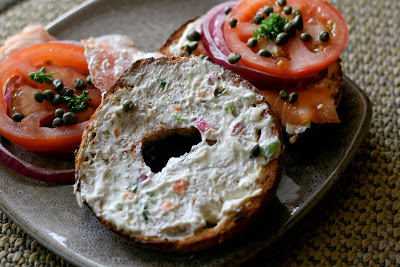 One of my favorite things was their vegetable cream cheese, so creamy and flavorful. I was watching the food network one day and saw who else but Ina Garten whipping up this beautiful cream cheese, so I jotted down the recipe ASAP and vowed to make it. And here it is! In a medium sized bowl, whip the cream cheese until it is creamy. 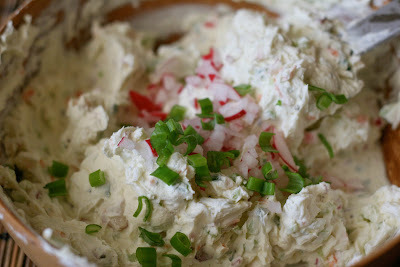 Add the rest of the ingredients into the cream cheese and mix until everything is well incorporated. Place into tupperware and refrigerate for approximately 24 hours to let the flavors meld. Spread over your morning bagel, sandwich, etc. and enjoy! How do I like to enjoy my veggie cream cheese? 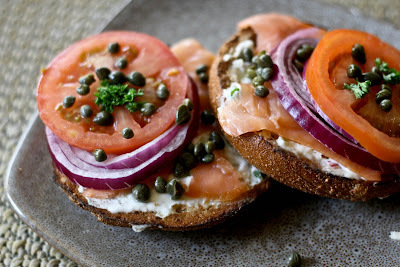 The most classic way possible: on a bagel, and of course with plenty of lox, tomatoes, red onion, and capers. DEE-licious! But it's great in omelets, smothered in sandwiches, with chips and salsa or just by the spoonful (just kidding, but hey if that's your preference, no judgement here). And there goes my stomach, audibly growling at that last photos! Great looking breakfast, and one of my absolute faves. OMg I love love love LOX! yum. This looks great, Ina always delivers! Oh those bagels look good! My mom used to make a cheese spread just like that, but with ricotta instead of cream cheese.